It's been a major year for Kaley Cuoco. In 2018, she entered a new chapter, marrying Karl Cook after getting engaged on her birthday last year. And the couple still seems to be basking in their newlywed bliss. "Kaley and Karl are super happy still, they love each other and love being married," a source close to Cuoco told E! News. "He isn't home a lot though, he works remotely four or five days a week so her weekends are mostly devoted to spending time with him." But Cuoco is also saying goodbye to a major part of her life after 11 years: The Big Bang Theory, the beloved sitcom that has made her one of the highest-paid actresses on TV, is coming to an end. But life must go on after the final bazinga is said and Cuoco is preparing for it—both professionally and personally. Knowing they don't need to depend on each other financially makes Cook and Cuoco appreciate each other more. "I don't need Karl for anything. If Karl left me tomorrow, I'd be fine," the 32-year-old actor tells the magazine. "And he knows that, and he would be fine, too." Cuoco began dating Cook in 2016, after she bonded with the professional equestrian over their mutual love of horses when they met—where else?—at a horse show. Riding horses "totally changed my life, for so many reasons," Cuoco, who now owns nine horses, told Women's Health earlier this year. Of course, one of those reasons is that it led her to her "soul mate," following her devastating divorce from Ryan Sweeting one year prior. "I finally found my horse guy. I know. It was meant to be," she said on The Talk in 2017. Following that heartbreak from her split with Sweeting, an insider close to Kaley called her relationship with Cook the "best" one she's ever been in. "After her marriage and other past relationships, this one definitely stands out as being different," the insider told E! News. "She loves his sense of humor and feels like he brings out the best in her. She trusts him completely and after she was burned in the past, she appreciates how genuine he is. They are in it for the long run but she doesn't know what the future holds. They are totally in love and happy together." And that future held a surprise proposal, which happened on her 32nd birthday last year, and soon went viral given Cuoco's tear-filled acceptance. Seven months later, Cuoco and Cook said "I do" in a summertime ceremony in San Diego (on his horse farm, of course) in front of their closest family and friends. She wore a custom Reem Acra gown that took 400 hours to make. Fittingly, the ceremony took place in front of a giant horseshoe-shaped flower structure with feathers. "When your 'honeymoon' is shoulder surgery and your husband looks just as happy lol on the road to recovery - thank you for all the love and support," she wrote on Instagram. While she wasn't able to do normal things like tie her own shoes or do her own hair, she was back in the gym just three weeks post-surgery, sling and all. "Staying in shape is hard and it takes work, so when you find a program that works for you, don't let it go!" she wrote on Instagram in October. Because she was an athlete growing up, making time to work out is essential for Cuoco, and she detailed her routine to Women's Health. "If I get a little bit bored, I'll switch over to SoulCycle, which I love too. It's all or nothing. I'm hot or cold. I'm not a gray area," she shared. "So if I'm doing yoga, we're doing it every day this week...then I'm like, 'Oh my god, I have to switch.' Then I'm going crazy on SoulCycle....'OK, I have to switch.'" While her workout routine often changes, Cuoco hasn't had the same randomness in her career over the last decade, thanks to her plum gig on The Big Bang Theory. 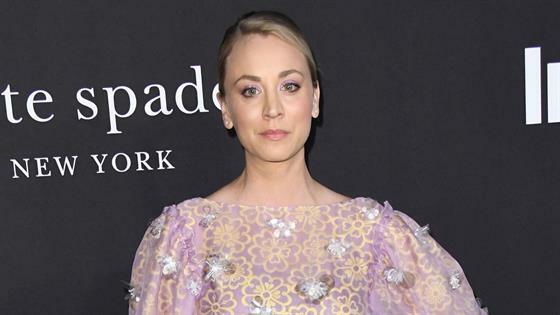 Given the insane popularity and success of TBBT, as well as all of Cuoco's endorsement deals, it's safe to say the star is financially secure—she even snagged the second spot on Forbes' 2018 list of the highest-paid TV actresses. But all good things must eventually come to an end, and in August, CBS announced that its highest rated show would be ending after its current season (12). "We are forever grateful to our fans for their support of The Big Bang Theory during the past twelve seasons. We, along with the cast, writers and crew, are extremely appreciative of the show's success and aim to deliver a final season, and series finale, that will bring The Big Bang Theory to an epic creative close," the network and producers said in a statement. And the choice to end the series "was definitely tough," Cuoco told James Corden during an appearance on The Late Late Show. "There was not a dry eye in the room; a lot of hysterical sobs…It's time now, I guess, to move on to other things, which is so heartbreaking. It's been a long run and we're very grateful." So what are Cuoco's hopes for the show's ending? "I'd like to learn Penny's last name," she joked during a visit to The Talk, also adding that she'd at least like "for the elevator to be fixed." But Cuoco got serious when talking about how the impacted her over the last 11 years, "This show is really special and it has changed my life." So what's next for Cuoco professionally once her time as Penny officially ends? Well, she already has her next TV gig lined up, and it's a pretty big one: Meet your new Harley Quinn, as she is set to star and executive produce the new Harley Quinn animated series for DC Universe, the new subscription streaming platform launched by DC Comics. Cuoco posted the announcement on her Instagram, writing, "So excited .. we have been working on this adult series for awhile [sic] and can't wait for you to see it next year..it's edgy, crazy, and seriously funny ! Harley's back! Thanks, puddin!" And through her production company, Yes, Norman Productions (named after her beloved dog), Cuoco got the rights to The Flight Attendant, a miniseries based on the book of the same name, which she was poised to star in. The Flight Attendant follows Cassandra Bowden, a flight attendant, who wakes up, hungover, in her hotel room with a dead body next to her. She goes about her day and heads back to New York. Is she the killer? Both TV projects serve as part of her exclusive multi-year first look production deal with Warner Bros. Television. Still, there is one dream job Cuoco has: To appear on Vanderpump Rules. Cuoco is a huge fan of the show, detailing her trip to Tom Tom, Lisa Vanderpump's latest West Hollywood restaurant she opened with stars Tom Sandoval and Tom Schwartz, which happened while the Bravo reality hit series was filming—much to Cuoco's delight. "I love her, I love reality TV. Me and my friends were having dinner at Tom Tom recently and we had made the reservation months in advance," she shared on The Talk. "I was on my way and I got a call from the manager apologizing, saying they were shooting and Lisa would like to move my reservation to one of her other restaurants. I said, 'No, we're fine, we want to go, we want to watch, we want to be there.'" She continued, "So we get there and they were shooting, I don't think we [me and my girlfriends] said one word to each other, we were watching the whole thing go down. Then, Lisa walks up and she was so precious... I said, 'Lisa, we are in heaven right now, this is like the greatest thing ever.'" When asked if that meant she might appear on the show, Cuoco quipped, "One can only hope!" Aside from her upcoming TV series, her other project might be her biggest one yet: motherhood. A source close to Cuoco told us the timing might be right after The Big Bang Theory officially ends in May for the star and Cook to become parents. "Kaley would love to have kids but she will likely wait until after this final season of Big Bang Theory and once that wraps up start trying to have babies," the insider said. "Her next project is just a voiceover gig so it's a good time for her once BBT wraps!" In an interview with Entertainment Tonight, Cuoco discussed having kids with Cook, saying it was in their future. "I'm not quite there yet but I know that I will be because I love kids. But I'm a worker bee right now...kind of my career is my focus and my husband," she said. "But we love kids and we love animals, so we're meant to have children." Regardless of whatever comes next for Cuoco as she heads into this exciting next chapter of her life, she's meeting it with confidence in herself first and foremost. "I like knowing, though, that I'm [financially] set, because I've taken it upon myself to do that," she told Women's Health. "I like to tell my friends, 'Always make sure you have your life going, and that you're No. 1, so that anyone who comes into it—husband, or boyfriend or girlfriend, however you roll—that's just an added bonus to something you're already creating.'" She continued to say that being together is a choice for both of them, and they don't financially depend on each other. "I don't need Karl for anything. If Karl left me tomorrow, I'd be fine," she said, "And he knows that, and he would be fine too." Of course, people immediately misinterpreted what she meant, leading her to make a call to Ryan Seacrest to clarify her comments on his morning radio show. "I had to call in because it's so funny that one quote you're talking about has been taken a little out of context and only because yes I would be very upset if my husband left me," she said. "With that being said, I think in this climate and age women need to know that they are okay on their own and they can be stable without anybody else." She went on to say she's in a great place in her life, which is something that should be celebrated, regardless if she's married or single. "I feel like I'm a new person now and I can be on my own," she said. "Yes, I would be devastated if my husband left me, but at the same time, I know that I would be OK and that's kind of what I was trying to say." And the pair seemed happier than ever when they celebrated her birthday earlier this week at the happiest place on Earth: Disneyland, an annual tradition for Cuoco and Cook. "Same place, same pose, same love, a year later," she captioned a photo of the couple, "how has so much happened since then? Thanks for marrying me, @mrtankcook."